the most interesting thing I’ve seen this week is the appallingly named ‘Lemur’, from the really appallingly named French startup ’Jazz Mutant’. 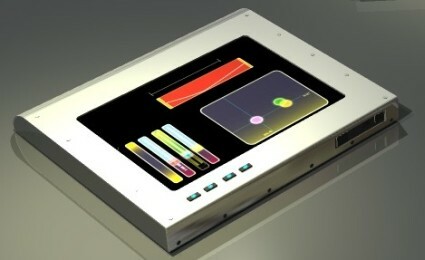 It’s a 12-inch touchscreen monitor with an embedded CPU / graphics chip and an ethernet port. Plug the screen into a laptop and it becomes a control panel displaying movable faders, buttons and keyboards for live tweaking of music software. So far, so much like any design student’s final year project. Then, you watch the video clips on the site. They’re tiny and dark, and you can’t hear the music that’s being tweaked, but they’re amazing. The interface looks great and seems really responsive.